Master Gardeners of Northern Virginia | Celebrating 36 Years of Serving the Community! Fothergilla gardenii leaves in October. Photo by Elaine L. Mills, 2014-10-06, National Arboretum. Fothergilla gardenii fall foliage. Photo © Mary Free, 2014-11-09, Glencarlyn Library Community Garden. Native to southeastern coastal areas, Dwarf Fothergilla shines three seasons of the year. Spring brings sweetly-scented, white bottlebrush flowers that welcome pollinators. Its summer dress is a pretty green. Fall leaf color is spectacular, turning exquisite shades of yellow, orange or red that brighten up the woodland garden. Saturday, May 18, 2019 – 9 a.m. to 3 p.m.
Click on the photos from last year’s sale to watch the slide show – it was very wet but successful! Extension Master Gardener Elaine Mills organizing herbs for sale. City Nature Challenge 2019 – Calling All Gardeners! Is your cell phone a ubiquitous tool in your gardening efforts and education? Do you record spring ephemerals, leaf branching patterns, fleeting insects, roaming wildlife and indeterminate opportunistic flora? Then download iNaturalist to your cell phone, if you haven’t already, and contribute to citizen science in the upcoming City Nature Challenge, April 26 through April 29. Wednesday, April 17, 10:00 a.m. – 12:00 p.m. 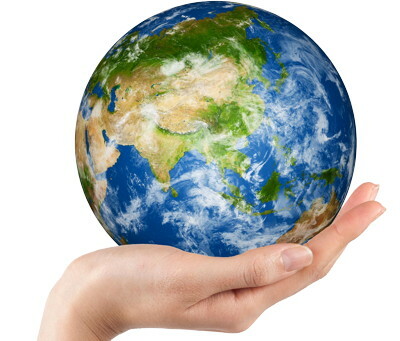 Enjoy a special Earth Day Festival to learn about compost, recycling, energy efficiency and much more. Play recycling games, learn how to compost and create upcycled art. Stations include representatives from AIRE, Virginia Cooperative Extension, Environmental Services, Arlington Art Truck, Remove Invasive Plants, Creative Arts, Fitness, and more. This activity takes place over Spring Break, and all ages are invited. Free. Questions? See Arlington Parks and Recreation Earthfest. Public education events are open to all, but space may be limited. To reserve a spot, please REGISTER ONLINE. Saturday, May 4, 10:00 a.m. – 3:00 p.m. Learn organic vegetable gardening techniques at our Organic Vegetable Demonstration Garden nestled in Potomac Overlook Regional Park. We have tips on composting, early planting, selecting best varieties, and more! Uvularia grandiflora (large-flowered bellwort) flower stamens close up. Photo © Mary Free, 2019-04-10, Quarry Shade Garden, Bon Air Park. Uvularia grandiflora (large-flowered bellwort) flower details in April. 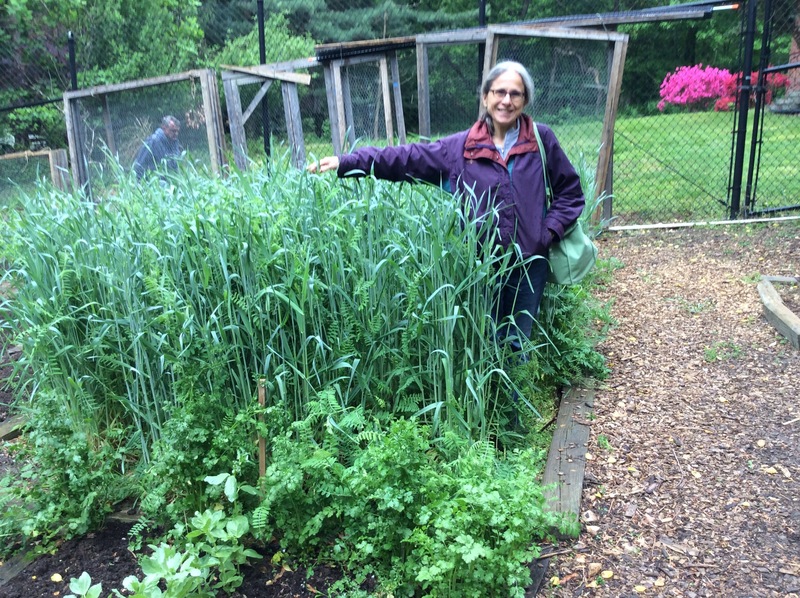 Photo by Elaine L. Mills, 2015-04-16, Demonstration Shade Garden. Uvularia grandiflora (large-flowered bellwort) en masse. Photo by Elaine L. Mills, 2015-04-16, Demonstration Shade Garden. Uvularia grandiflora (large-flowered bellwort) emerging buds and blooms. Photo © Mary Free, 2012-03-22, Demonstration Shade Garden. When planted en masse, graceful, nodding flowers create a lovely visage when they peek from under foliage, which also is attractive, especially to white-tailed deer. Even if deer are not a bother, foliage may disappear as temperatures heat up. Depending on where it grows, this native perennial may act like an ephemeral and enter early dormancy. Master Gardeners of Northern Virginia manage the Organic Vegetable Garden at Potomac Overlook Park in Arlington. Each year, this demonstration garden produces hundreds of pounds of produce which it donates to the Arlington Food Assistance Center. The following Notes from the Field, compiled by Judy Johnson and Judy Salveson, highlight some of the challenges the garden faced in 2018 due to record-breaking weather. In late February, we found some spinach, kale, tatsoi, cilantro and arugula had survived the winter. Because the weather was so cold and wet in March, seeds for most cool weather spring crops were put in later than usual and did not have enough time to get established before hot weather hindered their growth and quality. Peas were not successful. 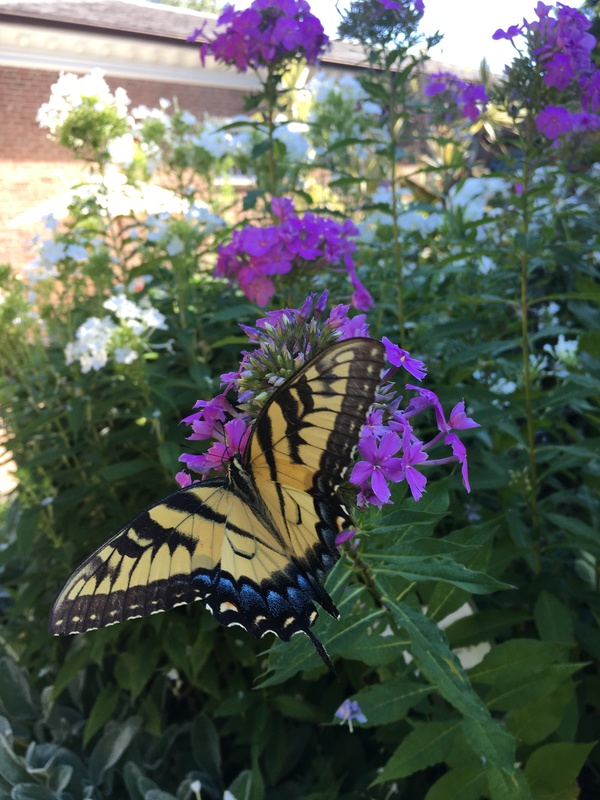 The Virginia state insect, the Swallowtail butterfly, nectaring on Phlox paniculata (garden phlox), at the Glencarlyn Library Garden. Nearly 20 years ago, I had a life-changing surgery. Since adolescence, my vision had become progressively more near-sighted, and by my early thirties, my uncorrected vision was 20/800. Contacts or glasses were a constant necessity. When I read without glasses, the pages of a large book would brush my nose when turned. Then a co-worker discovered that our agency’s insurance would pay 100 percent of the newly popular lasik surgery. Word spread through the office as one employee after another had the procedure, raving about the results. I became the 12th member of our work team to undergo the treatment. The result felt like a miracle. The day after my procedure I was gardening in my front yard (with safety glasses on to ensure no debris would damage the surgeon’s work), unable to stop laughing with sheer amazement at how sharp everything looked. Passers-by gave me strange looks – which I could see!